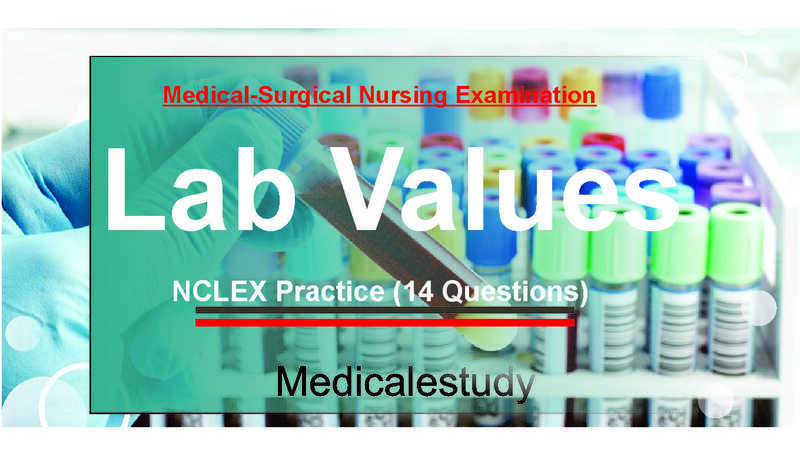 Lab values are an essential part in Medical exams. 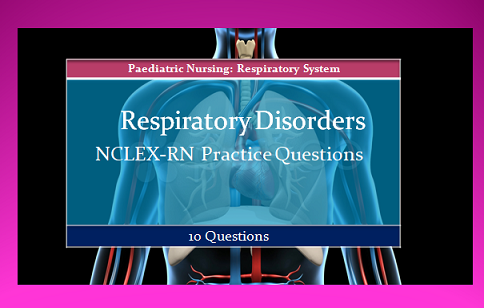 Here are the Practice questions for your upcoming Nursing exams. Every question is with answer and explanation. 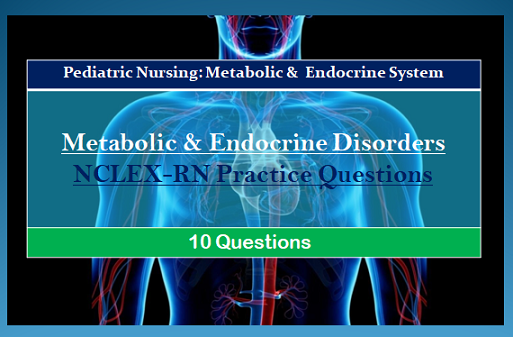 following are the collection of 14 Practice questions of nursing exams. A client with atrial fibrillation who is receiving maintenance therapy of warfarin sodium (Coumadin) has a prothrombin time (PT) of 35 seconds. On the basis of the prothrombin time, the nurse anticipates which prescription? Rationale: The normal PT is 9.6 to 11.8 seconds (male adult) or 9.5 to 11.3 seconds (female adult). A therapeutic PT level is 1.5 to 2 times higher than the normal level. Because the value of 35 seconds is high (and perhaps near the critical range), the nurse should anticipate that the client would not receive further doses at this time. Therefore the prescriptions noted in the remaining options are incorrect. Test-Taking Strategy: Focus on the subject, a PT of 35 seconds. Recall that the normal PT is 9.6 to 11.8 seconds (male adult) or 9.5 to 11.3 seconds (female adult) and that a therapeutic PT level is 1.5 to 2 times higher than the normal level. Remember that a PT greater than 30 seconds places the client at risk for bleeding; this will direct you to the correct option. The nurse checks the laboratory result for a serum digoxin level that was prescribed for a client earlier in the day and notes that the result is 2.4 ng/mL. The nurse should take which immediate action? 1. Check the client’s last pulse rate. 2. Notify the health care provider (HCP). 3. Record the normal value on the client’s flow sheet. 4. Administer the next dose of the medication as scheduled. Rationale: The normal therapeutic range for digoxin is 0.5 to 2 ng/mL. A level of 2.4 ng/mL exceeds the therapeutic range and indicates toxicity. The nurse should notify the HCP, who may give further prescriptions about holding further doses of digoxin. The option that indicates to record the normal value on the client’s flow sheet is incorrect because the level is not normal. The next dose should not be administered because the serum digoxin level exceeds the therapeutic range. Checking the client’s last pulse rate may have limited value in this situation. Depending on the time that has elapsed since the last assessment, a current assessment of the client’s status may be more useful. Test-Taking Strategy: Note the strategic word immediate. To choose correctly, you must be familiar with the therapeutic range for this medication and note that the level of 2.4 ng/mL is a toxic one. This will direct you to the correct option. A client has been admitted to the hospital for urinary tract infection and dehydration. The nurse determines that the client has received adequate volume replacement if the blood urea nitrogen level drops to which value? Rationale: The normal blood urea nitrogen level is 8 to 25 mg/dL. Values of 29 mg/dL and 35 mg/dL reflect continued dehydration. A value of 3 mg/dL reflects a lower than normal value, which may occur with fluid volume overload, among other conditions. 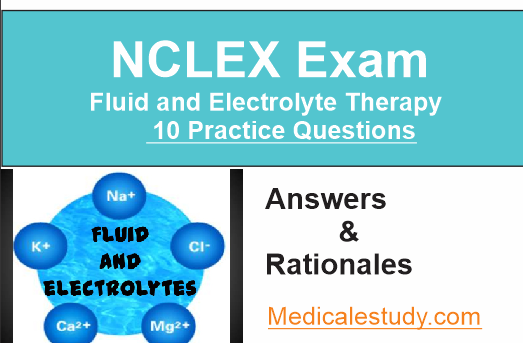 Test-Taking Strategy: Focus on the subject, adequate fluid replacement and the normal blood urea nitrogen level. The correct option is the only option that identifies a normal value. A client arrives in the emergency department complaining of chest pain that began 4 hours ago. A troponin T blood specimen is obtained, and the results indicate a level of 0.6 ng/mL. The nurse determines that this result indicates which finding? Rationale: Troponin is a regulatory protein found in striated muscle. The troponins function together in the contractile apparatus for striated muscle in skeletal muscle and in the myocardium. Increased amounts of troponins are released into the bloodstream when an infarction causes damage to the myocardium. A troponin T value that is higher than 0.1 to 0.2 ng/mL is consistent with a myocardial infarction. A normal troponin I level is lower than 0.6 ng/mL. Test-Taking Strategy: Note that the subject of the question relates to troponin T. Knowing the normal level and that a level higher than 0.1 to 0.2 ng/mL is consistent with a myocardial infarction will direct you to the correct option. A client is receiving a continuous intravenous infusion of heparin sodium to treat deep vein thrombosis. 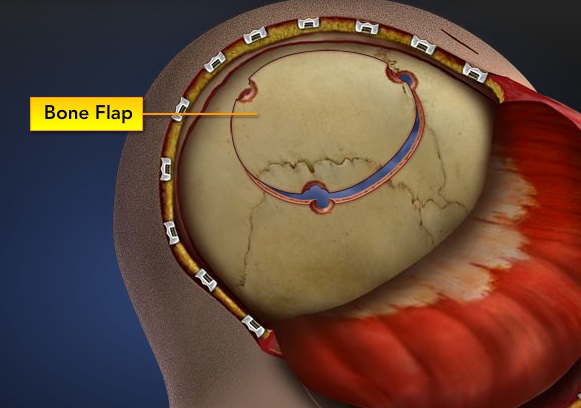 The client’s activated partial thromboplastin (aPTT) time is 65 seconds. The nurse anticipates that which action is needed? Rationale: The normal aPTT varies between 20 and 36 seconds, depending on the type of activator used in testing. The therapeutic dose of heparin for treatment of deep vein thrombosis is to keep the aPTT between 1.5 and 2.5 times normal. This means that the client’s value should not be less than 30 seconds or greater than 90 seconds. Thus the client’s aPTT is within the therapeutic range and the dose should remain unchanged. Test-Taking Strategy: Focus on the subject, the expected aPTT for a client receiving a heparin sodium infusion. Remember that the normal range is 20 to 36 seconds and that the aPTT should be between 1.5 and 2.5 times normal when the client is receiving heparin therapy. Simple multiplication of 1.5 and 2.5 by 20 and 30 will yield a range of 30 to 90 seconds. This client’s value is 65 seconds. A client with a history of cardiac disease is due for a morning dose of furosemide (Lasix). Which serum potassium level, if noted in the client’s laboratory report, should be reported before administering the dose of furosemide? Rationale: The normal serum potassium level in the adult is 3.5 to 5.0 mEq/L. The correct option is the only value that falls below the therapeutic range. Administering furosemide to a client with a low potassium level and a history of cardiac problems could precipitate ventricular dysrhythmias. The remaining options are within the normal range. Test-Taking Strategy: Note the subject of the question, the level that should be reported. This indicates that you are looking for an abnormal level. Remember, the normal serum potassium level in the adult is 3.5 to 5.0 mEq/L. This will direct you to the correct option. Several laboratory tests are prescribed for a client, and the nurse reviews the results of the tests. Which abnormal laboratory test results should the nurse report? Select all that apply. Option 1, 2, 4, 6 is correct answer. 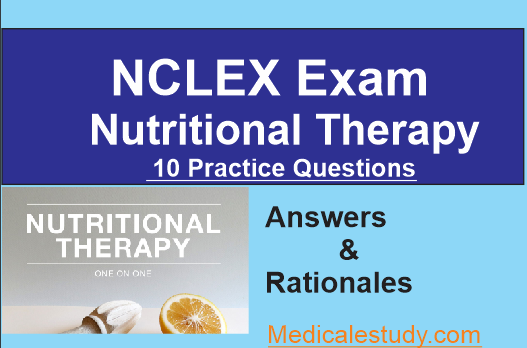 Rationale: The normal values include the following: calcium, 8.6 to 10 mg/dL; magnesium, 1.6 to 2.6 mg/dL; phosphorus, 2.7 to 4.5 mg/dL; neutrophils, 1800 to 7800 cells/mm3; serum creatinine, 0.6 to 1.3 mg/dL; and white blood cells, 4500 to 11,000 cells/mm3. The calcium level noted is low; the magnesium level noted is low; the phosphorus level noted is normal; the neutrophil level noted is low; the serum creatinine level noted is normal; and the white blood cell level is low. Test-Taking Strategy: Focus on the subject, the abnormal laboratory values. Recalling the normal laboratory values for the blood studies identified in the options will assist in answering this question. An adult client with cirrhosis has been prescribed a diet with optimal amounts of protein. The nurse evaluates the client’s status as being most satisfactory if the total protein is which value? Rationale: The normal range for total serum protein level in the adult client is 6 to 8 g/dL. The client with cirrhosis often has low total protein levels as a result of inadequate nutrition. Excess protein is not helpful, though, because a function of the liver is to metabolize protein. A diseased liver may not metabolize protein well. The options of 0.4 g/dL and 3.7 g/dL identify low values, and 9.8 g/dL identifies a high protein value. Test-Taking Strategy: Note the strategic word most. Recalling the normal total protein level will direct you to the correct option. A client with diabetes mellitus has a glycosylated hemoglobin A1c level of 9%. On the basis of this test result, the nurse plans to teach the client about the need for which measure? Rationale: In the test result for glycosylated hemoglobin A1c, 7% or less indicates good control, 7% to 8% indicates fair control, and 8% or higher indicates poor control. This test measures the amount of glucose that has become permanently bound to the red blood cells from circulating glucose. Elevations in the blood glucose level will cause elevations in the amount of glycosylation. Thus the test is useful in identifying clients who have periods of hyperglycemia that are undetected in other ways. Elevations indicate continued need for teaching related to the prevention of hyperglycemic episodes. Test-Taking Strategy: Focus on the subject, a glycosylated hemoglobin A1c level of 9%. Recalling the normal value and that an elevated value indicates hyperglycemia will assist in directing you to the correct option. The nurse is caring for a client with a diagnosis of cancer who is immunosuppressed. The nurse would consider implementing neutropenic precautions if the client’s white blood cell count was which value? Rationale: The normal white blood cell count ranges from 4500 to 11,000/mm3. The client who has a decrease in the number of circulating white blood cells is immunosuppressed. The nurse implements neutropenic precautions when the client’s values fall sufficiently below the normal level. The specific value for implementing neutropenic precautions usually is determined by agency policy. The remaining options are normal values. Test-Taking Strategy: Focus on the subject, the need to implement neutropenic precautions. Recalling that the normal white blood cell count is 4500 to 11,000 cells/mm3 will direct you to the correct option. A client brought to the emergency department states that he has accidentally been taking two times his prescribed dose of warfarin (Coumadin) for the past week. After noting that the client has no evidence of obvious bleeding, the nurse plans to take which action? 1. Prepare to administer an antidote. 2. Draw a sample for type and crossmatch and transfuse the client. 3. Draw a sample for an activated partial thromboplastin time (aPTT) level. 4. Draw a sample for prothrombin time (PT) and international normalized ratio (INR). Rationale: The next action is to draw a sample for PT and INR level to determine the client’s anticoagulation status and risk for bleeding. These results will provide information as to how to best treat this client (e.g., if an antidote such as vitamin K or a blood transfusion is needed). The aPTT monitors the effects of heparin therapy. Test-Taking Strategy: Focus on the subject, a client who has taken an excessive dose of warfarin. Eliminate the option with aPTT first because it is unrelated to warfarin therapy and relates to heparin therapy. Next, eliminate the options indicating to administer an antidote and to transfuse the client because these therapies would not be implemented unless the PT and INR levels were known. The nurse is assigned to a 40-year-old client who has a diagnosis of chronic pancreatitis. The nurse anticipates the client’s serum amylase level to be which value? Rationale: The normal serum amylase level is 25 to 151 units/L. With chronic cases of pancreatitis, the rise in serum amylase levels usually does not exceed three times the normal value. In acute pancreatitis, the value may exceed five times the normal value. The options of 45 units/L and 100 units/L are within normal limits. The option of 500 units/L is an extremely elevated level seen in acute pancreatitis. Test-Taking Strategy: Focus on the subject, a client with chronic pancreatitis. Recalling the normal amylase level will direct you to the correct option. An adult female client has a hemoglobin level of 10.8 g/dL. The nurse interprets that this result is most likely caused by which condition noted in the client’s history? Rationale: The normal hemoglobin level for an adult female client is 12 to 15 g/dL. Iron deficiency anemia can result in lower hemoglobin levels. Dehydration may increase the hemoglobin level by hemoconcentration. Heart failure and chronic obstructive pulmonary disease may increase the hemoglobin level as a result of the body’s need for more oxygen-carrying capacity. Test-Taking Strategy: Note the strategic words most likely. Evaluate each of the options in terms of whether each is likely to raise or lower the hemoglobin level. Also, note the relationship between hemoglobin level in the question and the correct option. A client with a history of gastrointestinal bleeding has a platelet count of 300,000 cells/mm3. The nurse should take which action after seeing the laboratory results? 1. Report the abnormally low count. 2. Report the abnormally high count. 3. Place the client on bleeding precautions. 4. Place the normal report in the client’s medical record. Rationale: A normal platelet count ranges from 150,000 to 400,000 cells/mm3. The nurse should place the report containing the normal laboratory value in the client’s medical record. A platelet count of 300,000 cells/mm3 is not an elevated count. The count also is not low; therefore bleeding precautions are not needed. RBCs function in hemoglobin transport, which results in delivery of oxygen to the body tissues. RBCs are formed by red bone marrow, have a life span of 120 days, and are removed from the blood via the liver, spleen, and bone marrow. The RBC count aids in diagnosing anemias and blood dyscrasias. The RBC count evaluates the ability of the body to produce RBCs in sufficient numbers. Nursing consideration: Fasting is not required. Hemoglobin is the main component of erythrocytes and serves as the vehicle for transporting oxygen and carbon dioxide. Hemoglobin determinations are important in identifying anemia.